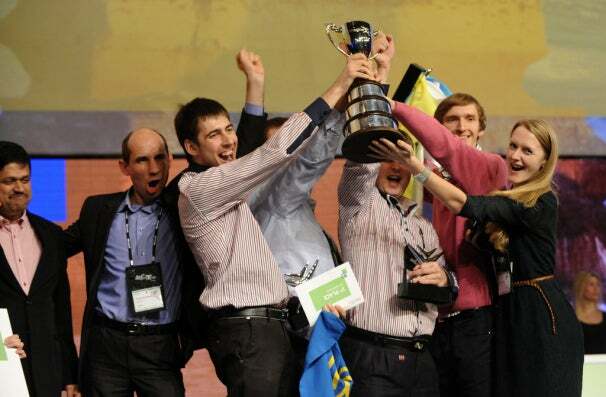 While Imagine Cup winners have come up with some truly nifty stuff over the years, this ingenious piece of work from Ukrainian team QuadSquad sort of takes the proverbial cake. EnableTalk, QuadSquad's award-winning invention, was built on the spine of a simple yet important question: How do you break down the communication barrier between the deaf and the rest of the world? With black leather gloves, circuitry, and intelligent software, obviously. The glove comes outfitted with more than a dozen flex-sensors and built-in accelerometers capable of registering both the timing and the direction of the operator's hand movements. A controller on the globe can analyze and interpret those signals before relaying them via Bluetooth to a text-to-speech engine that translates them into spoken speech. EnableTalk may not be the first of its kind--we covered a similar project from students at Cornell University in May--but it's certainly the one of the most economical examples of the idea so far. According to the EnableTalk website, the base cost of an EnableTalk prototype is roughly $150, a figure that is expected to drop to $75 once further development has been conducted. Sadly, we probably won't be seeing it on Amazon anytime soon. Right now, the gloves are only capable of translating five different phrases in sign languages, something that severely limits its effectiveness in real world situations. However, co-creator Maxim Osika has apparently stated that the team is already working on expanding the device's repertoire of phrases and making it compatible with both Android and iOS devices.